All the talk of bean and lentil-eating traditions around the New Year suits me perfectly. They are thought to bring prosperity and health. I’ll happily discuss and cook those darlings any day so all the recent posts and meals cooked by friends that contained black-eyed or yellow-eyed peas and lentils have been a treat. A New Year’s day party at Cathy Whims’s of the fabulous Nostrana featured said yellow-eyed peas (from Rancho Gordo) and were a creamy, tender revelation served with garlicky collards and rice stewed in a rich tomato sauce, all inspired by my friend Bryant Terry’s wonderful book The Inspired Vegan. 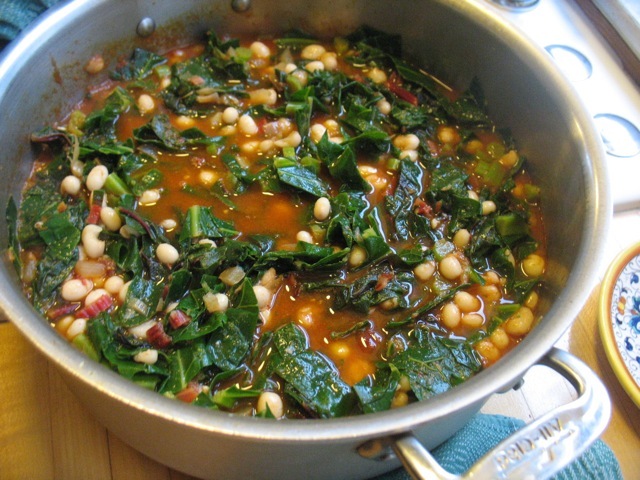 So last week I made my own variation of his Butter Bean and Tomato-Drenched Collards with Parsley. Any dish where I can toss in previously cooked (and often frozen) beans to make a meal that tastes like it’s been simmered for hours that very day, in little time makes me happy and a bit smug, I’ll admit. 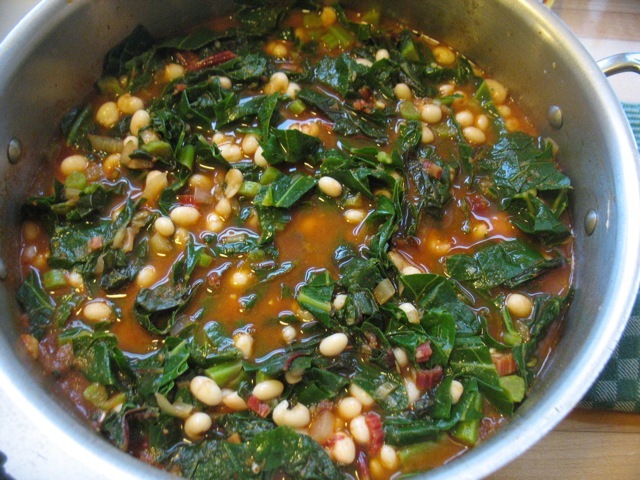 I used Ayers Creek Zolfino beans that I had previously cooked and let those stew with the collards and tomato sauce. I think most any bean would be good in this preparation so don’t sweat the details and use what you have. We ate this for several days and it just kept getting better. On the third day I had it for lunch over buttery Mashed Potatoes and Rutabagas inspired by another favorite new cookbook, Roots by Diane Morgan. That combination might have to be repeated. This is not only delicious but very economical, rounded out with good bread or a favorite grain or a couple of fried eggs, and can keep you sated for days. Finally, I have one spot left in my upcoming cooking class Winter Vegetables & Pantry Staples so sign up right away if you’re interested. Happy New Year and Happy Cooking! This makes a lot which is a good thing since it’s even better the next day. Bryant uses sun-dried tomatoes that he rehydrates and blends with the soaking liquid, vinegar, lemon juice and tomato paste. I’ve had good results cooking down regular canned tomatoes with the vinegar and lemon juice so, use what you have to create a nice rich tomato sauce in which you cook the collards. And if you by chance oven-roasted frozen tomatoes from last fall, they are perfect for this dish. Bryant adds home-cooked butter (lima) beans and broth to the tomato-y greens for the last half hour of cooking. You can do the same, use different beans or omit the broth and serve the greens over rice or quinoa or another grain of your choosing or mashed potatoes and rutabagas! I used Zolfino beans from Ayers Creek Farm. Put the dried tomatoes in a small bowl and cover with boiling water. Let soak for 20 minutes. Drain and reserve liquid. Thinly slice the collard stems and set aside. Cut the leaves into bite-sized pieces. Bring a pot of salted water to a boil. Toss in the collard stems and cook for 2 minutes. Add the leaves and cook for 2 more minutes. Drain well. Put the soaked tomatoes, tomato paste, lemon juice vinegar and 1 cup of soaking liquid in a blender or food processor and process until smooth. In a large pot heat the olive oil and add the onion and sauté for a few minutes. Add the garlic and Serrano and sauté for another 3-5 minutes until just beginning to brown. Add the tomato mixture and cook for 20 minutes until it begins to thicken, stirring frequently. Add the reserved collard leaves and stems, the broth and the beans and simmer on low heat, partially covered for 30 minutes. Stir in the parsley, adjust seasoning and serve. This is even better the next day! 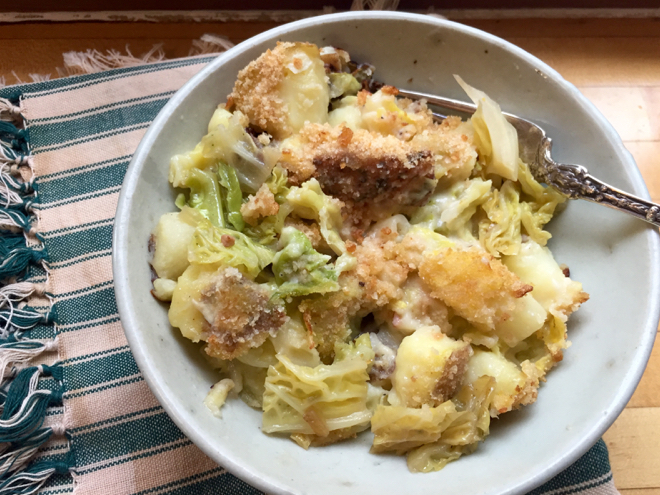 This is simple comfort food and uses a lot of cabbage. Leftovers are delicious. In this version I added a handful of small, tubetti pasta, which is totally optional. You could add lots of chopped parsley or oregano or basil or chives to the dish as you’re assembling it, before baking. You could use other vegetables. I imagine diced winter squash instead of the potatoes would be fabulous and very pretty. Sausage, bacon or any kind of leftover meat would be good. You can vary the cheeses, omit entirely, and so on and so forth! Melt butter in a medium-sized saucepan over med/low heat. When melted, whisk in flour. Continue cooking the roux for 2 -3 min, whisking frequently. Meanwhile heat milk until it’s scalding. Whisk hot milk into roux and add salt, black pepper, chili flakes (or omit if you’d like), add mustard and a bay leaf and a grating or two of nutmeg. Stir well and cook over med/low heat for about 10 minutes until thickened and bubbling. Add the cheese and fresh, chopped herbs, if, using. Put potatoes in a large pot with lots of water and two teaspoons salt. Bring to a boil. If you are using some kind of pasta you’ll want to add it to the potatoes so they’re both done at the same time. The pasta can be quite al dente when you drain everything though since it will keep cooking in the oven. When the potatoes (and pasta, if using) are almost tender add the cabbage to the pot. Cover and cook for another few minutes until the cabbage is tender. Drain. Spread the vegetables in a large baking dish. Pour the béchamel over the top and mix in a bit. Sprinkle with breadcrumbs and optional cheese and bake at 400 until bubbly and crisp on top. Run under the broiler for a few minutes for more browning. We u-picked a lot of berries last summer–strawberries, blueberries, raspberries, and marionberries. For the first time, my son was old enough to toddle among the rows, eat berries and amuse himself (for the most part – I did have to cut one trip short because he was “harassing” another little boy). And I took full advantage! We picked 25 lbs of gorgeous and perfectly ripe strawberries one day. I hadn’t really thought through how I was going to process them all and didn’t have time for much. I rinsed them, hulled them and packed them in 1 quart yogurt containers and tossed them in the freezer. I thought I’d make jam or ice cream or sauce when I had more time. Well I did the same with the blueberries and the raspberries. I never made any of those other things except for a few batches of jam. So my generous stash of frozen berries has lasted me this long. I opened my last quart of blueberries and strawberries this morning for one of our favorite breakfasts. 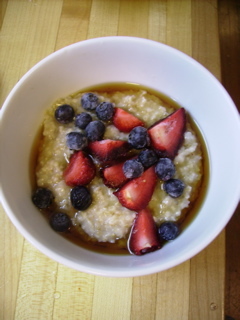 Throughout the late fall and winter I’ve cooked a pot of steel-cut oats (I soak the oats over night which makes cooking them in the morning a quick affair) and topped them with frozen berries and maple syrup. It is perfect in so many ways. The berries thaw and soften in the steaming cereal and cool the oats down to a perfect temperature. The berries literally taste like they were just picked. As corny as it sounds, every bite is a vivid flashback to summer–the smells, the warmth, the dirt and berry juice under your fingernails.. .. it is lovely, warm, and nourishing. And a wonderful way to start the day. This is also an incredibly inexpensive breakfast. You can’t beat the price and quality of fresh (frozen) u-picked fruit and steel-cut oats in bulk cost next to nothing. And then you can splurge on good maple syrup. 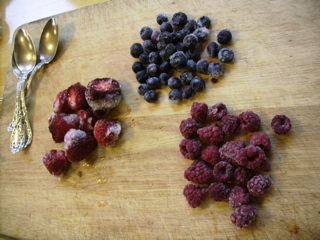 All of this to say, if you have the chance to u-pick berries this summer and have a freezer, pick lots and lots and don’t feel badly about not processing them. You will enjoy the fruits of your labor (pun intended!) all winter long. I will remind you of this come June and we’re in the swing of berry season. The night before you’re planning on making this, put the oats in a saucepan and cover with a couple inches of water. By morning the oats will have absorbed most if not all of it. Add the salt and another 2 cups of water, cover, bring to a boil and then turn down to a simmer. Cook for about 10 minutes. If you forget to soak them you’ll just have to cook them for about 30 -40 minutes with much more water in the morning. Top with the fruit and maple syrup, stir well and eat!